Loading bays can be a very busy place. Vehicles carrying various kinds of goods are going to and fro throughout most of the day from one place to another. In this case, traffic is definitely unavoidable much of the time. And in order to minimise traffic and organise every vehicle in operation, traffic lights were invented. They help to facilitate the movement of vehicles to avoid collisions, and at the same time help people become more disciplined. And speaking of traffic lights, there are different types of traffic lights that are being used today depending on the application it will be used for. So this week’s subject is about a specific type of traffic light, the IPN/002 Series, a 2-way LED Traffic Light and our product of the month for May 2017. We’re also going to briefly discuss about its primary features and as well as its capabilities that make it stand out above the other traffic light devices. Long Life LEDs – The IPN/002 Series is made up of LED bulbs, and LEDs as we all know are very power efficient, have less maintenance cost compared to other traditional lamps and longer operational life which can last up to 30-50 thousand hours of operation. Simple three-wire connection – This feature allows a straightforward integration with your current system. The 24Vac/dc model can be connected directly to your existing dock leveler or door control system for your convenience. Stop/Go traffic light with High-quality Wide-Angle LEDs – As with any other traffic lights, the IPN/002 Series has a Stop/Go feature which would greatly help you to organize the flow of traffic in your loading docks. It is also equipped with high-quality wide-angle red & green LEDs with clear lens for increased attention grabbing signalling, even when viewing off-axis. Safety – The IPN/002 Series not only provides help to facilitate the vehicle’s movements around a loading dock, but also provides safety in order to avoid and minimize unnecessary accident. 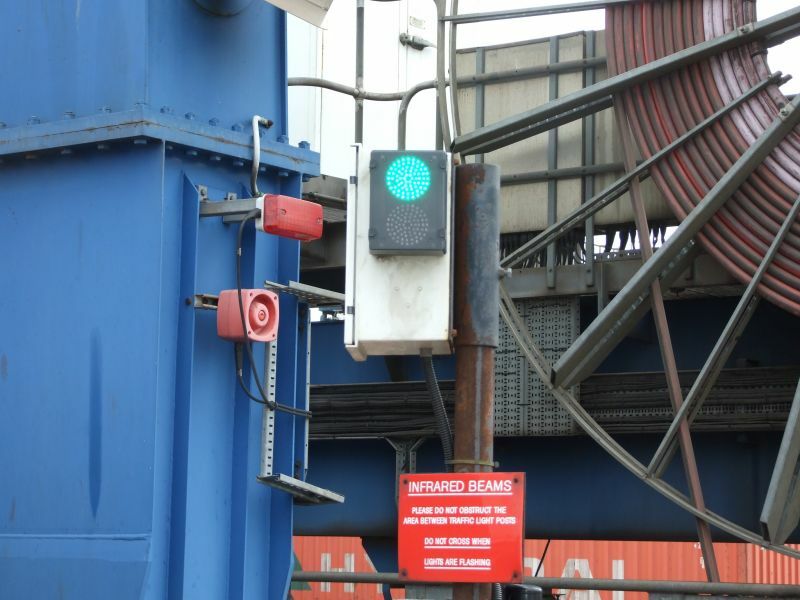 The red and green lights provide a clear line of communication with immediate and unmistakable instruction between drivers and loading dock staffs to reduce the risk of confusion and error. Function Selection – When power is applied into a relevant terminal, the red or green light will immediately light up and reach maximum output of brightness without warming up unlike other traffic light devices. Robust Design – Even if an individual LED fails or burns out, the remaining LED bulbs will still remain functioning which allows continues operation in your loading docks without being interrupted in case one of the LED bulbs burns out. 24Vac/dc, 115Vac and 230Vac models – The IPN/002 Series is also available in these three different models depending on the application, voltage and intensity of brightness that best suits your loading docks. Certified IP65 – The IPN/002 Series also offers protection which makes it more durable. It is rated as “dust tight” and is protected against water projected from a nozzle. The IPN/002 Series is one of D.G Controls Ltd most popular products, as they are equipped with the latest LED bulbs that can be found on the market today. We can say that this is the most suitable type of traffic light in your loading docks because of the many advantages it offers especially the features listed above. For more details about the product, you can visit beaconlamps.com/products/traffic-management-signals/led-status-signals/ipn002-series/ for complete and additional information. Factory Automation – Is It Necessary?